Hotfoot Hurdle is the fifth level of World 6 found in Yoshi's New Island. 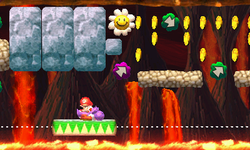 Yoshi starts the level in an autoscrolling lava-themed area with some enemies and spiky platforms which can be rotated if Yoshi presses a switch. A pipe takes Yoshi to an area with moving platforms and the nearby Checkpoint Ring, along with rotating wooden platforms. A door leads Yoshi to a Checkpoint Ring and some conveyors which take him to the Goal Ring.